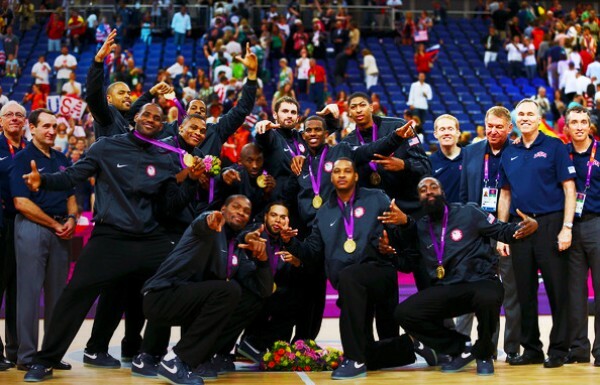 The new 'Dream Team' is now celebrating for winning the gold medal in London 2012 Olympics: Basketball Mens Game. U.S men's basketball overcome the fierce resistance from Spain with the score of 107-100, at the Olympic championship on Sunday, August 12. In three quarters, USA led Spain for just one point but it turns out that the USA players hit up and boost out their strength in the last quarter that made them lead by 7 points. LeBron James said, "We knew it wasn't going to be easy. We didn't want it easy." Kevin Durant give 30 points to lead USA to victory while LeBron James added 19. Kevin said while holding his own piece of gold medal, "Everybody wants to make that comparison, but at the end of the day we're both wearing these." For Kobe Bryant scored 17 points, this was his last Olympic moment. He confirmed his decision to retire from international basketball after winning his second gold medal. Meanwhile, a total of 104 Olympic medals are now on the hands of different U.S.A. Athletes, which leads them far from their country competitors. China on the other hand has now A total of 87 medals leading 5 medals against Russia. Comments or suggestions about "London 2012 Olympics: Basketball - USA wins by 7 points over Spain" is important to us, you may share it by using the comment box below.